If your family chose to partake in an open adoption relationship with your child’s birth mother, you are definitely not alone. According to the Independent Adoption Center, the majority of the 4,000 families that used its services chose open adoptions. 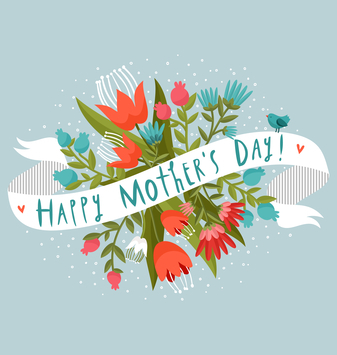 As Mother’s Day approaches, you may be wondering whether or not you should honor the birth mother of your child and, if so, what would be the best way to do so? The answers to these arising questions will rely on your relationship with the birth mother. Mother’s Day can be a sensitive time for a birth mother, so it is important to take her feelings into consideration. If she has expressed a desire for limited contact, respect her wishes. But if your child’s birth mother and your family enjoy a strong relationship, giving her a gift on Mother’s Day would be an excellent way to show her how much you appreciate all she has given you. If you prefer to keep Mother’s Day a separate holiday for your family, consider celebrating Birth Mother’s Day instead. According to Adoption Options.com, this holiday is celebrated the day before Mother’s Day. Celebrating Birth Mother’s Day may also be more convenient. For example, your child’s birth mom may want to spend Mother’s Day with her own mother. In addition, this arrangement will give both adoptive mother and birth mother separate days to be the center of attention. Having a hard time saying how you feel? 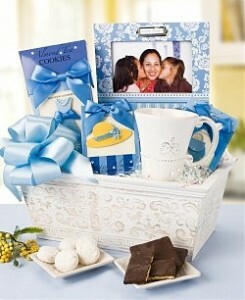 Consider giving the birth mother a special gift. When in doubt, ask others who know the birth mom their opinion of your present to make sure that you are choosing the right gift for her. Jewelry – Adopt Shoppe offers the simple, but elegant Attribute necklace, which features three rhodium pendants that say, “Courage and Hope,” “Faith” and “Love.” This necklace is your way of saying you understand that she had to have these attributes in order to give up her child for adoption. Edible treats – Chocolate covered strawberries always make for great Mother’s Day gifts, but FTD’s healthy yet delicious sweet blooms tower is an unexpected surprise. Because this gift can be delivered directly to her house, this is an excellent choice for a birth mother who does not live near you. Gift cards – Although, some people consider gift cards a bit impersonal, the right one may be welcomed by your child’s birth mother, especially if she is struggling financially. If she is a student, for example, consider purchasing her an Amazon.com gift card so she can purchase textbooks or other supplies she might need for school. Photos – If you enjoy a close relationship with your child’s birth mother, you might want to put together a hardbound photo book of your child to give to her. This gift will surely bring a smile to her face and create a deeper connection between the entire family. 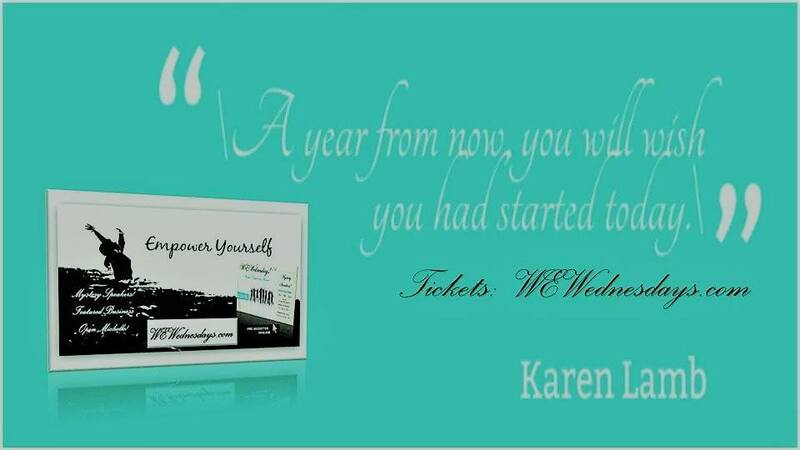 Our Gift Show MAY 4 will host elegant gifts for all Mothers ranging from body wraps, candy, candles, chocolate, crystals, essential oils, stones, flowers, hand-made glassware, handbags, lingerie, PJs, jewellery, skincare, soaps, and so much more !!! 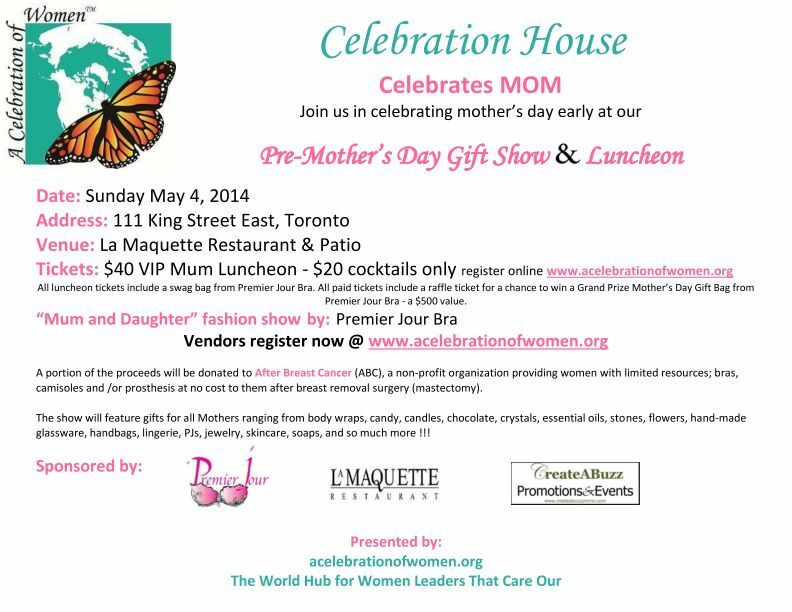 Also this day will be celebrating the amazing Spring/Summer 2014 FASHION SHOW hosted by Premier Jour Fine Lingerie and Swimwear, Toronto, Ontario – Founder, CEO After Breast Cancer (ABC). % PROCEEDS will be donated to After Breast Cancer on this day. ENJOY an Amazing Fashion Show, Gourmet Lunch, and Gift Show – all in one ‘Mother – Daughter’ day!